A good crowd turned out for Mack Brown’s debut back at Kenan Stadium despite the rain. This is Dakota with Monday’s sports notebook. It was raining all weekend, but UNC fans still made their way to Kenan Stadium for the much-anticipated return from Mack Brown. 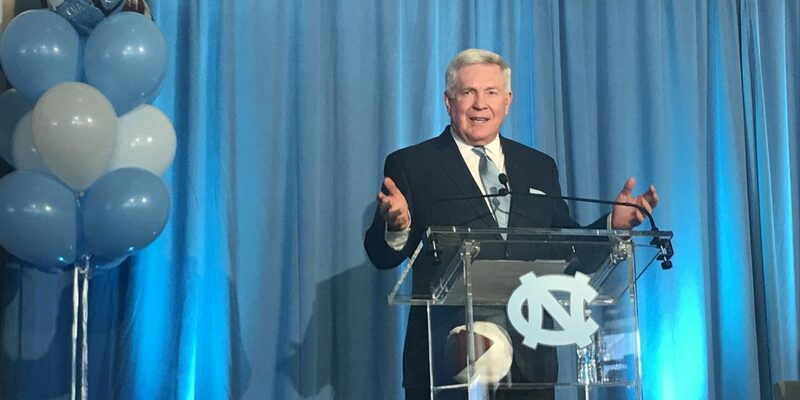 The Hall of Fame head coach, who left Chapel Hill in 1997 to take the job at Texas, was greeted with loud cheers when he took the field on Saturday. The game itself was nothing to write home about. Instead of a traditional game, Brown opted for a 70-play scrimmage as an appetizer for this fall. Brown also operated as head referee and could be heard on the loud speakers directing his staff and telling them where to place the ball. At the very end, Brown let kicker Noah Ruggles attempt a long field goal to give his team the win. Ruggles’ kick was good and it was perhaps the first kick in NCAA history that was worth 18 points. The three quarterbacks each had a chance to impress their new head coach. In particular, Jace Ruder stood out for his scrambling ability and Sam Howell had the best throw of the day on a 42-yard touchdown pass. Offensive lineman Charlie Heck and defensive back Patrice Rene both said after the game that they have been impressed with the play of the quarterbacks all spring. In the end, Carolina’s spring game was a great taste for fans on what the future of this program could look like. The freshmen performed well and the team had an overall sense of consistency. The players who spoke to the media said that the team has bought in to Brown’s message, a great sign after back-to-back seasons of missing a bowl game. After the game, Brown and his team stayed on the field and personally thanked the fans for coming out to see them play. It was a nice moment and reminded fans that Brown really does care about the UNC football program.